Jon Athan: Writing Updates for January 2016! Writing Updates for January 2016! Well, here's the first writing update of 2016. Simply typing '2016' makes me giddy for several reasons. I've been writing and publishing since 2014 and it feels great to continue this year. Plus, I have so much planned for the foreseeable future. I'm very excited to share everything I've been writing in due time. Anyway, let's get to the updates. First and foremost, The Black Lake: Tales of Melancholic Horror is available now. Thank you for making this release my most per-ordered book since 2014! As I've previously stated, this is my final anthology for the time being. If you enjoy what you read and would like to see more, please leave an honest review on Amazon. I'm currently in the process of editing my horror-possession novel, Project: Possession, which will release in March 2016. As I previously mentioned, this book is primarily inspired by The Exorcist (the film) and my distaste for most contemporary exorcism/possession films. I aimed to push the boundaries and explore new methods of horror with this book. The book follows a single father, Jamie, and his son, Casey, as they are haunted by an inexplicable presence. A strange ailment? A ghost? A demon? We'll find out in March, so keep your eyes peeled. Project: Killers is a serial killer horror/thriller novel slated for April 2016. The book will be edited after Project: Possession. This story follows two serial killers on different ends of the spectrum. A traditional serial killer catches a whiff of a more cunning murderer, then tries to befriend him. When the pair bump heads, blood begins to shed. This is easily my most disturbing book. When I officially reveal the title, I will strongly warn you about the content. Well, I think that's a long enough update for this month. I have another unannounced book in the works and I'm about to being another project this week, but I'll share those details at another time. As you can see, I've been very busy. Thank you for the support! I hope you have a wonderful year and enjoy the books! 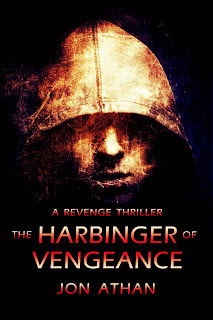 The Harbinger of Vengeance coming February. Pre-order for $2.99!